Drinking establishments were sprinkled throughout the Albina neighborhood and many people took advantage of these establishments to socialize and relax. Before Prohibition, the tavern or saloon was primarily a male stronghold. They were places where people talked politics, about their lives and problems and simple things like the weather. Men could have a congenial time as they stood at the bar (stools did not come into use until after Prohibition). 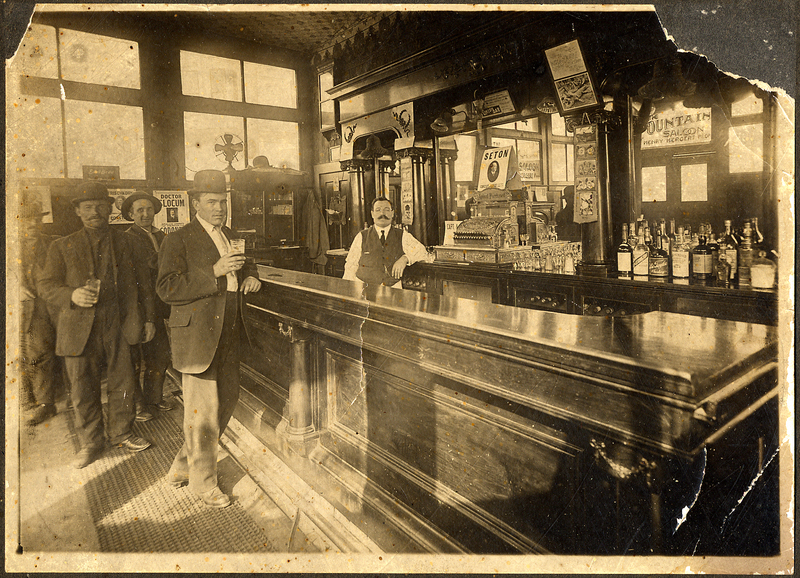 The Fountain Saloon with proprietor Henry Elias Hergert behind the counter. The Fountain Saloon was also known as Hergert's Saloon. Photograph courtesy of Carol Gass. Prohibition was not well received by many Volga Germans. Elder Peter Yost of the Free Evangelical Brethren Church reportedly gave his greatest sermon during this time stating that "food" was being taken away from the German people. Most of Volga Germans made their own beer during Prohibition from Blue Ribbon Brew - a special brewing malt barley. Officials tolerated this practice unless someone tried to sell their home brew. The bars themselves were usually ornate and made of wood with a gilt edged mirror in the center. Some of the furnishing came around the Horn from cities on the East Coast or from Europe. The back bar was made of shelves which held bottles and glassware. Typically, there were also murals and beer advertisements on the walls. Hidden under the bar were bottles and kegs of beer that were kept cool on beds of ice. Beer was drawn from the kegs by simple or sometimes ornate brass pressure taps or by a gravity faucet inserted directly in the keg. The saloon keeper kept a watchful eye on glasses and mugs to insure they stayed full. He was a friend, confidant and advisor to his customers. Many saloon keepers could brighten the room with humor and tall tales that kept the customers entertained. Over time, women began enjoying a beer at the local establishments, just like their male counterparts. In many families it was common for a father or mother who wanted to enjoy a beer with dinner to send a young child to the tavern or saloon with a tin pale. The pale would be filled by the saloon keeper and then transported home by the child, careful not to spill a drop. Beer pails (usually 2 or 4 quart lard buckets) were common in kitchens before 1900. 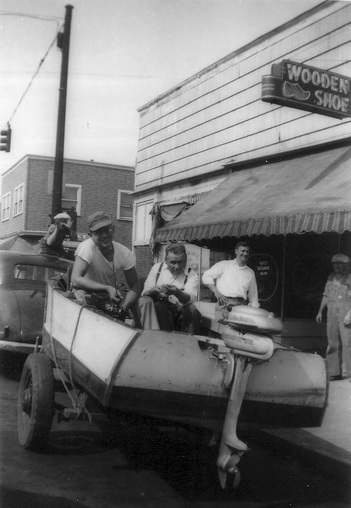 Henry Wunsch (seated in the boat and wearing suspenders) and friends at the Wooden Shoe. Photograph courtesy of Kris Wunsch Zelinka. Read Taverns in the Neighborhood by Roy Conrad Derring.